Authors: Wei Zhu, A. Udalski, S. Calchi Novati et al. Any readers particularly clued-up on exoplanet surveys might have recognised the phrase ‘OGLE’ in the name of planet ‘OGLE-05-390L b’. OGLE is the “Optical Gravitational Lensing Experiment“, a microlensing project run by Warsaw university. Although the mission was initially designed for dark matter surveys, it has also made several serendipitous exoplanet discoveries. This astrobite describes microlensing for exoplanet detection in more detail, but for today all we really need to know is that sometimes nearby stars and distant stars happen to be really well aligned on the sky for a short time. In these cases, the nearby star’s gravity bends the light from the far away star, causing it to be brighter for a short time: this is the process we call microlensing. If the nearby star also has a planet, which is also well aligned with the distant star, then the gravitational influence of the planet plus star system causes the brightness of the microlensing event to vary in a particular way. The planet/star mass ratio can be inferred from the precise shape of that brightness plot. This is, of course, the same physics that produces the stunning, strong-lensing Einstein Rings – but with a slightly weaker requirement for close alignment. Unlike the radial velocity, transit or direct imaging methods for exoplanet hunting, the microlensing technique is able to detect exoplanets at huge distances. Meanwhile, a field with physically more stars is a great place for microlensing experiments, since a large number of stars need to be monitored for a long time so as to catch some of these chance alignments of foreground and background stars. As such, OGLE has been staring at the center of the galaxy for over a decade. More recently, the microlensing community has become particularly interested in microlensing detections which have been measured by multiple different telescopes simultaneously. In a typical microlensing event, the mass and the distance of the foreground lensing star are degenerate. However, this degeneracy can be broken by comparing several, simultaneous observations of the microlensing event with physically separated telescopes. The wider the separation between the different telescopes measuring the microlensing detection, the better – so why not use a telescope in space? The Spitzer telescope is almost 200,000,000km away, giving an impressive distance baseline for this kind of work. Figure 1: Sensitivities to planets for a subset of the survey. Red, Green, Blue, Purple and Black curves show the depth to which 15, 30, 45, 60 and 75% of planets could be detected. q and s represent the mass ratio and projected separation of the planets. The bottom left corner lists the OGLE catalog number (bold) and the impact parameter, which represents the closest on-sky separation of the two stars during the entire event. Adapted from Figure 13 in the paper. Today’s authors carry out a pilot study laying out the methodology for a microlensing survey of how the galactic bulge affects planet formation. 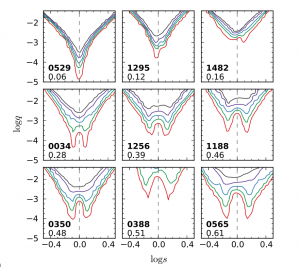 After data validation, removal of instrumental systematics, and a check that the distance to each star is well defined, the authors use a sample of 41 microlensing events – all of which have been observed by OGLE, Spitzer and a third telescope, namely KMTNet. Each of these microlensing events consists of a distant and a nearby star – and in this case no planets are detected around the nearby stars. 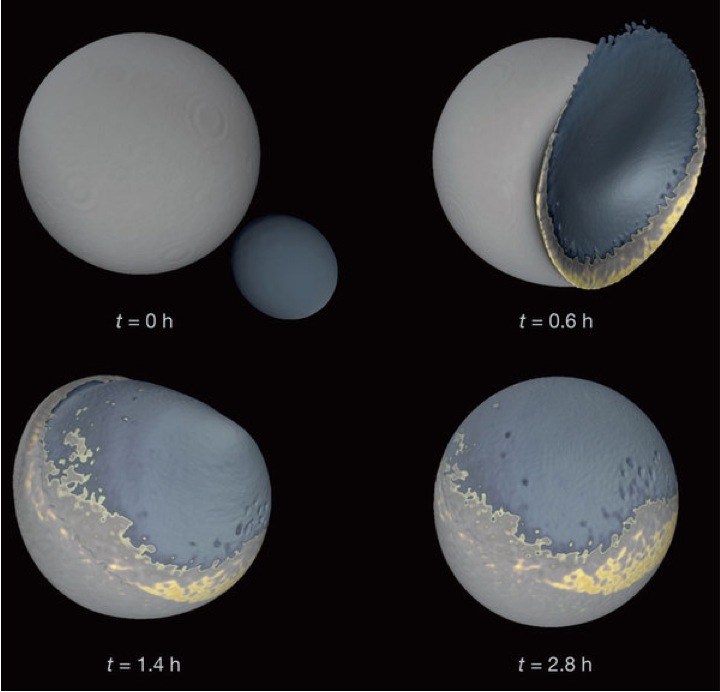 The authors model each of the lensing events with a variety of planets orbiting the nearby star, so as to figure out how sensitive the survey is to exoplanets, as a function of mass and separation. Some of these sensitivity curves are shown in Figure 2 above. They then carry out a statistical analysis: for this they use a simple parametrised model of the galaxy as a bulge and a disk, a couple of different assumptions about the stellar mass function, the footprint of survey on the sky, some beastly Bayes calculations and information about their survey’s sensitivity to planets. On the assumption that planetary frequency is the same in the galactic bulge, the authors find that roughly a third of all planetary detections in a survey like this one should come from bulge events. Since they have no planet detections in this sample, they aren’t yet able to calculate what fraction of detections actually come from the galactic bulge – this is left as future work. If the number turns out to be significantly different from the value of one third calculated here, it will reveal crucial information about planet formation in crowded regions of the galaxy. This work is currently ongoing. And, if they get lucky, maybe OGLE-05-390L b’s record as most-distant-planet will soon be broken! 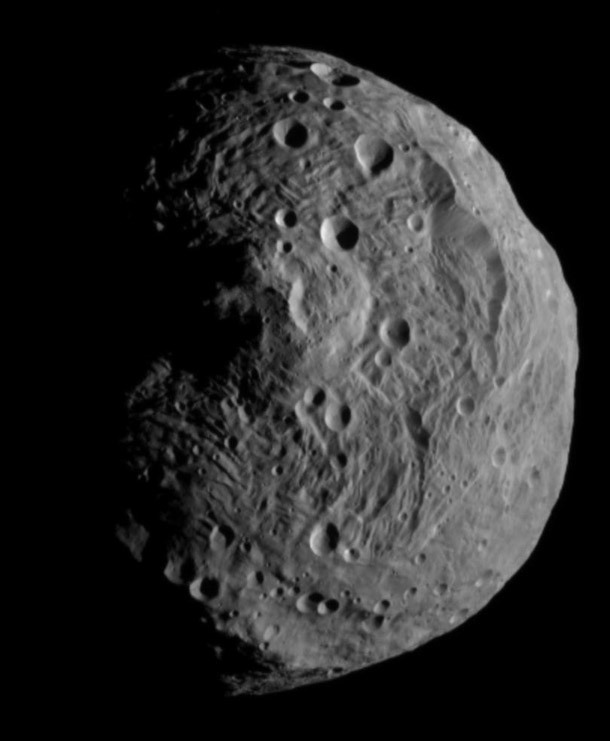 Vesta: The Last Remaining Planetary Embryo Did our Earth have 2 Moons? A Cosmic Vanishing Act Diaries of a Dwarf Planet: What are Those Spots on Ceres?